I was not long born the day my uncle stood on the battlefield, surrounded by the corpses of his men. They had died defending this narrow gully through hills which blocked the approach to the city of Eboracum. The city lay to the east under a pall of smoke that arose from a hundred burning houses. King Aelle had taken the army there to capture it but, hearing reports of an enemy warband coming to lift the siege, had sent Cynric and his company around the city to the west to intercept them. Eighty men marched through the night to reach this sunken road. They planted their flag in the ditch so it streamed in the wind, revealing the image of the running wolf emblazoned upon it. Then, they gathered about it and waited. They did not have to wait long. Soon after dawn, over three hundred spearmen came down the road and needing to reach the city urgently, attacked at once. The narrow confines of the gully funnelled the enemy and brought them onto the spears of Cynric’s men. Then, the killing began. The enemy paid dearly for each step they took, bled heavily for each wound they inflicted and three died for each of our own men slain. But, in the end, it was not enough. One by one, Cynric’s companions perished and as the company dwindled, it was pushed back down the lane. Time and again, my uncle rallied his men and they charged back into the fray, regained ground and forced the enemy to retreat. But now, as the sun sank and the sky turned a crimson red matching the bloodstained clay of the road beneath them, Cynric’s company were all dead. All dead, that is, apart from my uncle, Cynric and the grim-faced Grettir. The pair stood on the road in front of their battle standard. Cynric: tall and fierce, with hair the colour of autumn leaves, which in the dying light must have seemed almost like flames; Grettir: shorter, stocky and muscular with black hair and bushy eyebrows. Cynric thrust forward his great sword and pointed it at the shield wall. It was a magnificent weapon, forged from rods of twisted iron overlaid with the strongest of steel, crossed by a bronze guard and finished with an elaborately patterned pommel. With it he now gestured at several enemy warriors, picking out − or so it seemed − his next victims. Strapped to his other arm was his bright blue shield, which was dented and scuffed from a hundred sword and axe blows. Grettir had abandoned his and now both hands grasped the shaft of a fearsome axe that had already today slain a score of foes. Together, they glared down the lane and waited for the enemy to attack once more. There in front of them many more than one hundred enemy warriors still remained and they, having now reformed their shield wall and seeing that only two foes were standing, came on again. Eboracum lay just a mile beyond this lonely pair standing beside their flag, which now hung limp in the still evening air. If the warband could reach the city they could swell the numbers of the beleaguered defenders and the city might hold. If that happened, more of the Eboracii tribesmen from the surrounding lands would come here. 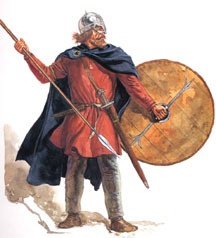 They would save Eboracum, then the Angles and Saxons − like Cynric and Grettir − who had risen up from their scattered villages and come here to capture the city, would be slain. Then, there would be no English city; no English kingdom here north of the Humber; perhaps even no English race anywhere. All that was needed was to kill these two men and march on to Eboracum. For Cynric and Grettir, this was equally clear. All they had to do was plant their feet on the bloody soil and survive just a little longer. Cynric glanced at Grettir and smiled thinly at him. Grettir just nodded back. Both men knew they would die here … it was just a matter of when. …all good stories are about a sword. 597 A.D. Betrayal threatens the Kingdom of Northumbria.